Is Filianism a Real Religion? 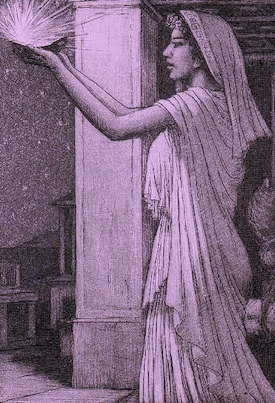 "One of the common sentiments I have fielded over years about Filianism or Deanism from outside the Herthelan community was that it did not feel like a real religion, did not address real-life concerns and questions of life — but rather a product of a fantasy subculture and even a pseudo-religion set up as an ancillary cultural prop to facilitate the role-playing games." I felt the blogger really did not answer this assertion. Could you please give your comments? I suppose the key question here is: What do we mean by a “real religion”? If we mean a faith that entails real belief and that is the center and mainstay of the lives of its adherents, Filianism/Deanism is certainly that as many can attest. Many of us certainly have difficulty in accepting modern mainstream liberal Protestantism as “real religion”. It seems far more concerned with whatever happen to be the current obsessions of the liberal mass-media than with eternal realities of any kind. It is difficult for many people to take this seriously as religion. It looks like secular socialism with a bit of “god” tacked on to pretty it up – or perhaps more like a church that once had a faith but has long since lost it and replaced it with other things. These churches look decidedly like a group of organizations that should really have disbanded when they lost their reason for existence but have continued because organizations have an inherent will to survive: and so when their religion died, something else had to replace it; and that something had to go on being called “religion” to maintain the fiction of organizational consistency. Now, this may be grossly unfair, but it is how it looks to the present writer and to many others that she knows. Similarly, regarding Wicca as a “real religion” is difficult for many. As is regarding the faith of those “feminist theologians” who forge a religion out of the moral and intellectual anarchy of post-modernism and deconstruction. Now, I am willing to accept that any or all of these may well function as “real religions” for at least some of their adherents, but I also have to say that they don’t look like real religions to me. I don’t say – as your quotation does – that they don’t “feel” like real religions, because I think one can only feel a thing from within. But from the outside they don’t look like real religions. Now what exactly is meant by “addressing real-life concerns and questions of life”? And is this a sign of “realness” in a religion? Liberal Protestant churches can be said to address such concerns – and the way they address them can always be guaranteed to be identical with the ideological standpoint of the liberal mass-media. In many cases one could hardly conceive of belonging both to a liberal Protestant church and to the “other” political party. Does this make them “real religions”? Conservative Protestant churches address many real-life concerns such as homosexuality and abortion. The Islamic religion addresses real-life concerns by incorporating a complete system of law (shari’ah) which in most societies is not considered to be the role of religion. Some Deanic/Filianic communions have addressed “real-life concerns” much more than we do on this site, but generally Deanists/Filianists have taken the view that religion deals with the eternal and unchanging, not with the passing events of politics, and also that taking one side (as the liberal Protestants do) or the other (as the conservative Protestants do) is simply divisive and improper. Another element to this is that Deanic/Filianic faiths find themselves currently surrounded by a patriarchal culture. One could, under certain circumstances, speak of something akin to a Filianic shari’ah (we call it thamë), and there are several Scriptural passages that could underwrite such an approach. The idea that the Divine Law that shapes the cosmos (should) also shape(s) human life could easily be the basis for a theocratic view of life (one could also cite the very horror that liberal religionists experience at the word “theocracy” as evidence that their own “social involvement” by definition follows and does not lead secular ideology, and therefore is inherently not a religious social stance). And this, in a way, brings us to the question of role-play. To a certain degree, any Filianic household takes part in "role-play", to the extent that is not part of the patriarchal order and sees itself as part of an eternal order and lives according to that order. Then again, take the devout Hindu family living in America yet still, in their household customs, living as if they were in India. Is this role-play? 36. Like to a play is thy life, and the acting of mummers; like to a painted scene all the things of the world 37. The things of thy life and its acts and its purposes; where shall they be in an hundred score years from this day? Yet an hundred score years are no more than a breath in the measureless life of thy soul. 38. The things thou doest of themselves are nothing; the things thou buildest or that thou destroy; the things the foolish take for life’s high purpose are but painted scenes ’gainst which the play is played. 39. For the play is not on earth but in the Heaven, not in the body, nor yet in the mind, but deep within the heart. Accepting Filianic faith means – to a greater or lesser extent, depending on how central a role it is to play in one’s life – accepting a different kind of “play” from that accepted by non-Filianists. The Faith changes one’s life. It changes one’s values – unlike some other faiths, which are all too much at home with “the things of this world”. And that – from our point of view – is precisely the difference between a real religion and a false one. Lady Aquila writes: Religion does not have to be opposed to "this world". In traditional societies the religious perspective and that of society in general form an unbroken whole. The real point, as this article makes clear, is that current Western society is inherently non-religious if not anti-religious. It espouses a "philosophy" (pop-scientism) dedicated to explaining the world with no reference to its spiritual roots, and culturally it encourages – and enforces – a degree of coarseness, vulgarity and immorality that no genuinely religious person can participate in. This necessarily raises the question of so-called "role-play". Religious people, at least those like Filianists, who understand that coarseness is not "morally neutral" but that mental and verbal impurity is as damaging as physical filth (if not more so) are obliged to live and act in ways that are different from those of the surrounding culture. Filianists are by no means the only religious people in this position. Coarseness, sexual delinquency (and I am not talking about the "gay" question or any other minority question – I am talking about the mainstream), cynicism and harshness are deeply embedded in current Western culture at every level. A sincerely spiritual person cannot live in the manner of such a society: therefore, on some level, she has to opt out. Therefore she and her community of fellow believers necessarily engage in "role-play", if by that term you mean anything that is not "mainstream culture". The attack on "role-play" is really the self-policing of the mainstream's lackeys. The attack on "escapism" speaks for itself. Who regards "escape" as a crime? Why, the prison guards, of course.